Restaurant Rating Delicious food. Great service. Comfortable, understated ambiance. Quality without being fussy. Green Rating Deep Green. Vegetarian. Organic. Local. The kitchen minimizes food waste in imaginative ways. For example, the pulp from making juices is used in the burgers. Short of installing some solar panels on the roof, dining doesn’t get much more sustainable than this in Hong Kong. Location Sai Ying Pun. Near HKU at the intersection of Pok Fu Lam and Third St. Call for reservations – they’ve been getting a lot of media buzz so it’s often full. Hidden on a side street surrounded by traditional shops, the first thing you notice about Grassroots Pantry is there is nothing grassroots about it. The design gives you a distinct feel of quality and you can see the attention in every detail. The ambiance is understated with none of the fussiness of high-end dining or the kitsch many mid-range places. Our party of three shared a variety of dishes and drinks. We started with the quinoa salad which was light and simple. For mains, we had the Thai veggie green curry with brown rice, cold soba with marinated tofu and miso, and mixed mushroom linguine with truffle oil. The cold soba was outstanding with a great balance flavors and textures. It’s a perfect meal during the summer when our appetites may not be at their peak. The mixed mushroom linguine was also very tasty but has a heavier, creamy sauce that is quite filling. Be sure to savor the aroma of the truffle oil. The Thai veggie curry had a mix of seasonal veggies and hedgehog mushrooms that have a nice meaty texture. For desert we tried a coconut “cheese” cake, rice pudding and a Chocolate Dream smoothie. The cheese cake had a creamy texture. The smoothie though was too thick and didn’t really have the chocolate kick I was expecting. The rice pudding came in a fantastic decorative Indian bowl and had some nice spice flavors. It’s quite a generous portion that is easily shared by two. Overall the meal was thoroughly satisfying and enjoyable. However, I did have a small nit to pick. An undercurrent of coconut milk ran through too many dishes from the curry to the cheese cake, smoothie and pudding. I would probably skip the chocolate smoothie and go with a fresh fruit smoothie instead. 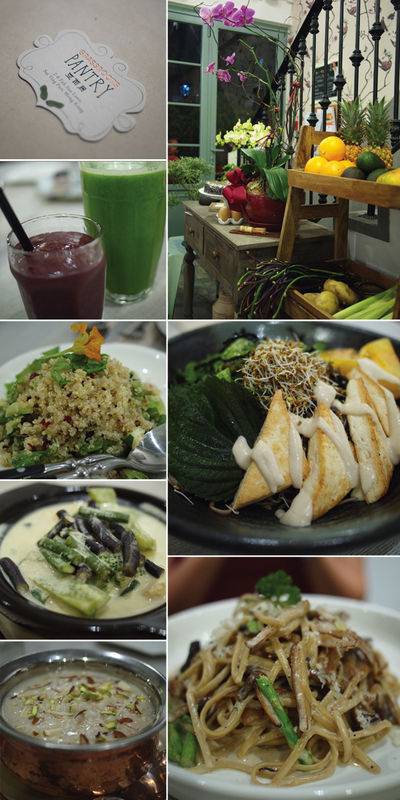 Grassroots Pantry is definitely a great choice for a sustainable and enjoyable meal with friends. The hedgehog mushroom in the Thai curry was so much more chicken than any veggie psuedo chicken I ever had. It was strictly joy to taste!